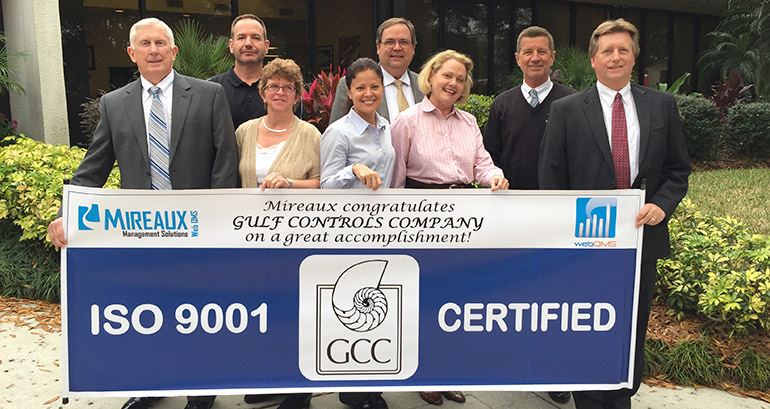 After 7 months of working with Mireaux Management Solutions, Gulf Controls Company, Inc., a factory-authorized distributor of pneumatic, hydraulic and electro-mechanical motion control products by the world’s top manufacturers, achieved ISO 9001 certification in December 2014. Below is one of the letters of recommendation we we received from Gulf Controls regarding our engagement and services. You can read a second recommendation in our Client Testimonials page. Mireaux’s team comprised of a Consultant, a Technical Writer, an Auditor, and QMS Software Support; all worked in tandem to not only ensure that Gulf Controls met the requirements of the ISO standard, but that it also improved in every aspect of its business. In the end, Gulf Controls was certified and everyone was happy that the baseline for even greater improvements had been established. Congratulations to the Gulf Controls Team! Gulf Controls Company team celebrates ISO 9001 certification. With this personal letter to you I am including a letter of recommendation for Mireaux Management Solutions and a photograph of our team with the banner that you so graciously provided. I tried to combine a thank-you letter with a letter-of-recommendation, but ultimately, could not put the two together, so I separated them in an attempt to do justice to both. I simply cannot thank you enough for all you did personally to help me and Gulf Controls. I don’t try to be difficult to work with, it just comes naturally. But to your great credit, you patiently work through each issue, and my frequent untimeliness, to keep us on track. I am afraid my words will not sufficiently express how grateful I am for you and the great team you have assembled and lead. Patience is not your only attribute. You are a professional in every way. You are truly an expert in your field, which was of great benefit to us and you are truly a good shepherd, guiding your clients with your knowledge, contacts and good judgment. I don’t know where it fits in this narrative, but I also enjoyed and appreciated your keen sense of humor; there are times when is the only lubricant that keeps things moving and you used it well. I sincerely hope my words will help prospective clients realize what a jewel Mireaux Management is, and I hope you realize how grateful I am for you and the work of your team.